I could not have designed a better experiment if I had tried. I am a neuroscientist and I am the father of two-year old triplets—two identical and one fraternal. As a professor at Yale University, I spend most of my time designing experiments, researching or teaching about the brain and the nervous system. The rest of my time I spend surrounded by my three daughters. To understand the dynamics in my household, think terrible-two’s, and then cube it. In the quiet sanctity of my lab, we study how the nervous system forms during development. In all animals, from humans to the tiny worms that we use for our experiments, neurons connect to each other and form circuits that underlie behaviors. Genes (made of DNA) underpin many aspects of development — from how our brain forms to the color of our eyes. 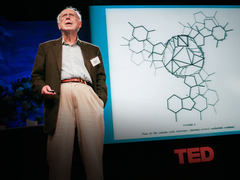 James Watson: How we discovered DNA My identical twin daughters look identical because they share all of their DNA; they are essentially clones of each other. They teethed exactly the same day, and their funky hairstyle is not the result of a visit to a stylist, but of genetics. Their personalities, however, are not identical. Not even close. The twin’s personalities, which share 100% of their DNA, are curiously more similar to their fraternal sister than to each other. That certainly came as a surprise to me. After all, argue all you want about nurture, but behaviors do have genetic underpinnings in the animal kingdom. Take reptiles; soon after hatching from its egg, a baby crocodile can hunt dragonflies with the same dexterity that its parents can hunt antelopes. Who taught the baby crocodile to hunt? Genes. I reflected about this a lot as I held my newborn daughters in the nursery room of the hospital. Human brains, at birth, do not appear nearly as impressive as a reptilian brain. For crying out loud, the tiny nematodes we use in the lab for our experiments can move around better at birth than a human baby! Newborns appear as blank slates. Are we really a “tabula rasa”? What are the roles of nature (genes) and nurture (our environment) in the development of our brains, in making us human? 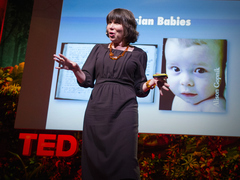 Alison Gopnik: What do babies think? My epiphany came with the first visit to the pediatrician. She closely monitored our daughters as they met, in unison, one developmental milestone after the other. As a neuroscientist, I knew what this timely emergence of complex behaviors meant: it is a hallmark of pre-programmed brains. But our pre-programmed brains are not for hunting dragonflies. The evolutionary pressures that have shaped our brains are different from those that have shaped the brains of swamp-bound reptiles. We are born into complex societies and quickly have to learn to negotiate our place within them. My three kids, the ones playing with my iPhone, are the same species as my ancestors, who 40,000 years ago were figuring out how to sharpen a rock and fit it into a spear. The Homo sapiens brain is wired in a very particular way: to allow us to connect to other human brains. Our home is testament — a cross between the Tower of Babel and a Univisión soap opera. It is filled with sound, from the tonal Chinese my wife has taught the triplets, to the slurred Puerto Rican Spanish they have learned from me. During the past two years I have witnessed how each of my daughters have masterfully decoded the complex rules of language and social interactions, in three very different and overlapping cultural contexts, and simultaneously. They confidently navigate between languages in a way that sometimes neither my wife nor I can follow. Chatty conversation and festive giggles are only one disagreement away from despair and temper tantrums over a train-set, a Crayola or a dinosaur shirt. But most melt-downs end with hugs, sometimes all three at the same time, as they can’t wait to make up. 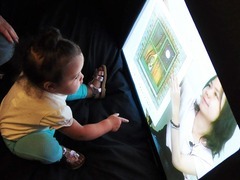 Patricia Kuhl: The linguistic genius of babies My daughters’ desire to connect is not just cute, it’s a matter of survival. So important is our need to connect to other human brains that extreme cases of child neglect have resulted in developmental problems not unlike those seen for mental retardation. These extreme cases tell us something profound about the brain. It tells us that even in cases in which normal genetics prime the brain to connect to other brains, the absence of human input cripples brain development. Our brains need other brains to develop properly. These seemingly delirious thoughts of a sleep-deprived scientist are neither new nor original ideas. Today it is broadly accepted that trying to separate nature from nurture is as asinine as trying to debate if a cake is made out of milk or flour. But this is important beyond a mere academic debate. In science, extreme cases are used to understand concepts. If no human contact during critical developmental periods can cripple brain development, what are the consequences of reduced stimulation due to a defective and underfunded educational system? The United States incarcerates more of its youth than any other country in the world — what are the consequences of growing up in a prison? We are social and co-dependent animals — what are the hidden costs to our society when we ignore the “nurture” part of the human development equation? The human brain has over 100 billion neurons — there are more neurons in a single human brain than stars in the Milky Way. When a parent stares at the lost, unfocused gaze of a newborn child, they are literarily staring at a constellation of possibilities, at a brain primed through evolution to connect to other brains, to devour information, to adapt and to reach its potential. In truth, I’m highly trained, but not that special; we are all born scientists, and our brains are molded by our favorite subjects of study, other humans. And I have the perfect experiment to prove that — my brain, which has been transformed by my daughters. Daniel Colón-Ramos is an Assistant Professor in the Department of Cell Biology and the Program in Cellular Neuroscience at the Yale school of Medicine, and is a Public Voices Fellow with The OpEd Project. Watch his talk from TEDxSanJuan, “Lost in Translation: The value of basic research in medicine,” below. Nature vs Nurture is by far a mind boggling question. Genetics play a huge role in how you will be. Like everything in life it can change. Weather the change is environmental or your culture it will change. Example Americans have become taller over the past century because of a spike in people living a healthier life. When a baby is born it has several natural instincts but after just a short time it goes away because they have already realized that they dont need that side. Very interesting….no wonder ultimately it is the environment which shapes us more than the genes and not vice versa….even genetical handicap -can be handled in a different way by different people due to their up bringing. Reblogged this on Albert Street. Quite fascinating and, for that reason, a little disturbing, speaking personally. I have a five year old boy with speech challenges. Instead of answering the most basic questions (where is mommy) he echoes the question at you. Things would look up if I thought that nurture could come to the rescue, but if it’s all down to nature (genes) then that tends to leave us helpless, doesnt it? Or , as the Bible says, from whence cometh our help?